George W. Bush is the 43rd President of the United States. He was sworn into office January 20, 2001, after a campaign in which he outlined sweeping proposals to reform America's public schools, transform our national defense, provide tax relief, modernize Social Security and Medicare, and encourage faith-based and community organizations to work with government to help Americans in need. 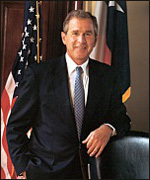 President Bush served for six years as the 46th Governor of the State of Texas, where he earned a reputation as a compassionate conservative who shaped public policy based on the principles of limited government, personal responsibility, strong families, and local control. President Bush was born on July 6, 1946, in New Haven, Connecticut, and he grew up in Midland and Houston, Texas. He received a bachelor's degree from Yale University in 1968, then served as an F-102 fighter pilot in the Texas Air National Guard. President Bush received a Master of Business Administration from Harvard Business School in 1975. After graduating, he moved back to Midland and began a career in the energy business. After working on his father's successful 1988 presidential campaign, he assembled the group of partners that purchased the Texas Rangers baseball franchise in 1989. The attacks of September 11th changed America - and in President Bush's words, "in our grief and anger we have found our mission and our moment." President Bush declared war against terror and has made victory in the war on terrorism and the advance of human freedom the priorities of his Administration. Already, the United States military and a great coalition of nations have liberated the people of Afghanistan from the brutal Taliban regime and denied al Qaeda its safe haven of operations. Thousands of terrorists have been captured or killed and operations have been disrupted in many countries around the world. In the President's words, "our Nation - this generation - will lift a dark threat of violence from our people and our future. We will rally the world to this cause by our efforts, by our courage. We will not tire, we will not falter, and we will not fail."